An elephant themed party is great idea for a child’s birthday party, baby shower, or even for a Republican candidate. The first thing you need to decide is if the party will be just elephant oriented or a jungle theme that includes elephants and other animals. You could also focus on a special elephant, such as Dumbo, Babar or Horton from the Dr. Suess book Horton Hears a Who. 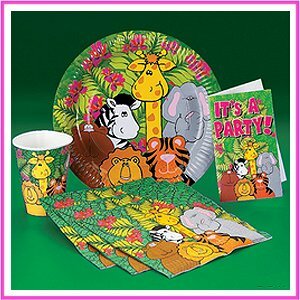 After selecting your theme, the fun part of selecting your elephant party supplies begins. To announce the party, elephant invitations are a must. To make your party easy to find, a stand-up cut out of an elephant could be placed outside in front of your house to welcome guests. You could also buy or make an elephant banner for the front door. As for what kind of food to serve, certainly setting out bowls of peanuts is in order. You can also serve peanut butter and jelly sandwiches. A cake either decorated with elephants, or shaped like an elephant would be a hit. Decorate the room with elephant shaped balloons. On the table set out stuffed elephants as a centerpiece and set with elephant place markers, plates, cups, napkins and party favors. Place elephant printed gift bags with goodies and small elephants inside at each place setting for guests to take home. For entertainment, rent elephant themed movies, such as Babar: King of Elephants, or Dumbo. Instead of pin the tail on the donkey, you could host a pin the tail on the elephant. Alternatively, purchase an elephant piñata and fill with elephant toys and candy. Have kids make elephant masks from paper plates and dance to jungle themed music. You could go all out and either hire someone to come dressed as an elephant, or rent an elephant costume and have a couple friends dress the part. You could even combine an elephant party theme with “white” elephant party rules. Instead of new gifts, guests would bring gifts they received but do not want, and everyone would go home with something different. There are so many fun ways to make your elephant themed party special since so many kinds of elephant party supplies are available. The hardest part will be deciding when to stop! You are currently browsing party ideas for Party Supplies.